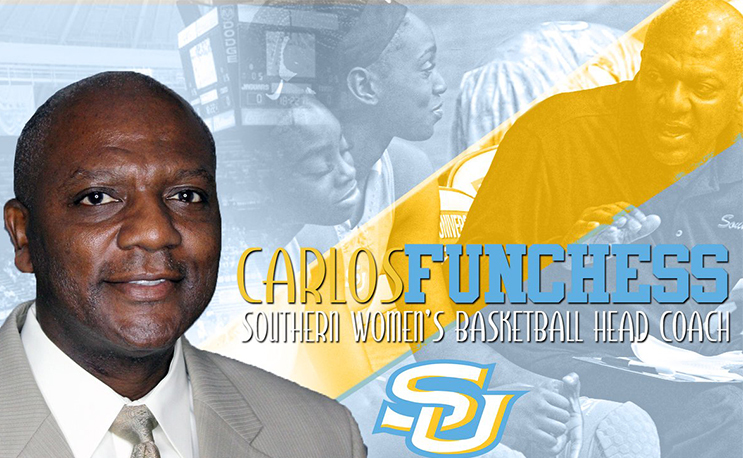 Southern University Athletics Director Roman Banks will introduce longtime assistant coach Carlos Funchess as the program’s next head women’s basketball coach during an introductory press conference on Thursday, June 21 inside the F.G. Clark Activity Center. During the previous 13 seasons, Funchess served as assistant coach under former head coach Sandy Pugh at Southern University, where he worked exclusively with the Jaguars post players, including All-SWAC performers Frederika Lewis, Freda Allen, Jasmine Jefferson and Briana Green. Since his arrival to Baton Rouge in 2005, Funchess has been instrumental in guiding the women’s basketball program at Southern University to five SWAC regular season and three SWAC Tournament titles. He replaces Pugh, who took over as Prairie View A&M coach earlier this spring after a successful tenure at Southern. A native of Magee, Miss., Funchess is a former two-time All-Southland Conference performer and the 1991 co-Player of the Year at then-Northeast Louisiana University (ULM) and received national recognition after his senior season when he won the 1991 College Slam Dunk Contest on ESPN. Funchess was selected in the Continental Basketball Association draft in the third round by Oklahoma City, U.S. Basketball League in Atlanta, and the World Basketball League in Saskatchewan. For the next three years, Funchess played for the Miami Heat, Global Basketball Association, U.S. Basketball League in Atlanta, Continental Basketball League in Sioux Falls, and played some overseas in Venezuela. In 2007, Funchess was inducted into the ULM Sports Hall of Fame. Before starring at Northeast Louisiana, Funchess played his prep basketball at Magee, Miss., High before going to Copiah-Lincoln Community college. In 1992, Funchess received a bachelor’s degree in Health and Human Performance from Louisiana-Monroe. He is married to the former Sondia Mills of Monroe and has two daughters, Tynee and Chelsea.